I read and posted my review for the fourth book in this series over the weekend. I realized that I had missed this one, so happily listened to the audiobook from Hoopla and my local library. This is the fourth book out of the five I hoped to read for Reading Ireland during the month of March. I want to start by saying that I listened to this book and absolutely loved the narration. Hearing this story with an Irish lilt gave it a realistic feel, especially with the Irish sayings and slang. The narrator, Caroline Lennon, did a great job with expression, voices and the telling of the story. I would recommend that you try to listen to this one if you can get your hands on an audiobook. Siobhán is now Garda O’Sullivan and is getting ready for her first day. When she is summoned in the wee hours of the morning by the local priest, Father Kearney, she heads off to the cemetery in the Churchyard to investigate a dead body above ground. With it being a murder, Sergeant Macdara Flannery, Siobhán’s ex-boyfriend, is summoned from Dublin to head the case. The victim is an American in Ireland to make a documentary about his Irish roots and ancestors. As Siobhán and Macdara investigate the family and documentary makers, it seems there is more than one suspect, as well as an old lady that has been seen skulking around. I really enjoy the character of Siobhán, a smart woman who uses her intuition and gut feelings to her advantage. She is a family woman, who takes care of her siblings and still makes the bread for the family bistro. She is hurting about the loss of her relationship of Macdara and I was happy to see that perhaps they might get back together. Technically, she is no longer an amateur sleuth, but I still consider this a cozy mystery. Her immediate supervisor, Garda O’Reilly, is not a very likeable character at all. He is constantly trying to get her in trouble and write her up, personally I think he is jealous of her success solving previous murders. The plot was well done with red herrings, clues sprinkled sporadically, some likeable characters, some not and a well paced storyline. I really enjoyed this story and figured out some things, but was still pleasantly surprised when the culprit and the motive were revealed in the story. 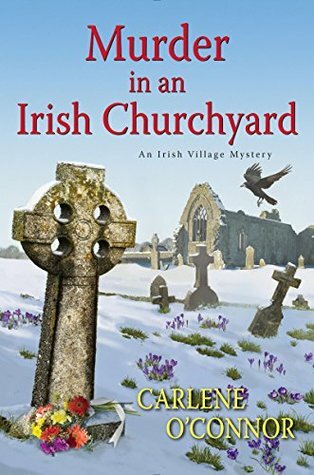 I will definitely continue to read or listen to this wonderful series from Carlene O’Connor and recommend it to cozy mystery lovers or those who enjoy a nice visit to the countryside of Ireland. About the Book: The village of Kilbane in County Cork, Ireland, has a new garda–and her first case is a grave matter indeed . . .
It’s official! Siobhán is now Garda O’Sullivan, and her five siblings couldn’t be prouder. While brother James runs Naomi’s Bistro, Siobhán is doing her part to keep the village safe. Of course, Kilbane is pretty quiet compared to a place like Dublin, where Macdara Flannery has gone to be a detective sergeant. Then one night the local priest summons Siobhán to the church cemetery. There’s a dead man in the graveyard–above ground. He lies shot on a blanket of freshly fallen snow, hand stretched out toward a nearby headstone. He’s a stranger, but the priest has heard talk of an American tourist in town, searching for his Irish ancestor. A detective sergeant is dispatched from Dublin to assist with the case, and as fate would have it, it’s Macdara. After his parting, things are awkward between them, but they have to work together. They learn the victim was from Dublin–Dublin, Ohio, that is. And when his family members are located and told of his murder, the plot thickens. Siobhán begins to dig for a motive among the gnarled roots of the family tree. But as long-buried secrets are unearthed, she and Macdara will need to stay two steps ahead of the killer or end up with more than one foot in the grave. You have to be ‘wide a wake’ when you read it! I really have enjoyed all of your Irish reviews for this challenge. I’ve added all of them to my reading list Carla. I have a few more coming up. I had no idea that Irish Authors were so talented. I am enjoying finding new authors thanks to Reading Ireland. This sounds like a good book, and I love the cover! This is another series that I really enjoy with great characters.